I have a confession to make: I’m really not a dog person — at least, I didn’t USED to be. But. three days ago, our family adopted a chihuahua we named Nacho (I know it’s “cheesy”). And, I’m hooked. But, it got me thinking about dogs at the beach. More specifically, what is the etiquette when it comes to dogs on the beach? How do I react when a dog approaches me? What if the dog approaches MY dog? What should I bring? Is the beach safe for my dog? Now that Hawaii has loosened its quarantine laws, and many visitors can now bring their pets on vacation, I thought I would post about this very important topic.I will make this a two-part post simply because there’s SO much information to remember! So, this post will focus on packing essentials, and the next post will focus on etiquette. Of course, before you even head-out to the beach, check and see if the beach even ALLOWS dogs. If you’re dog-phobic, you can avoid those beaches altogether. And, if you have a dog that doesn’t play well with others, you’ll want to stay away. A small bottle of vinegar: According to the website, PetHub, dogs can easily fall victim to sea lice, or worse, jellyfish. If your dog should suffer a sting, douse the affected area in vinegar to ease the pain and kill off the stinging barbs before trying to remove the tentacles. Also, check with lifeguards about how strong the tides are, as well as any potential hazards lurking underwater that could injure your pet, including seaweed and rocks. Portable Water Bowl and Water: PetHub says you should be sure to take a portable water bowl with you to the beach. While the ocean water may seem like a good source for drinking water, allowing your dog to drink the salt water can cause serious health issues. Dogs don’t have the ability to process large amounts of salt, so it builds up in their bodies and can make them very sick, or even prove fatal. This is especially true if the dog is older, very young, or has other health conditions. 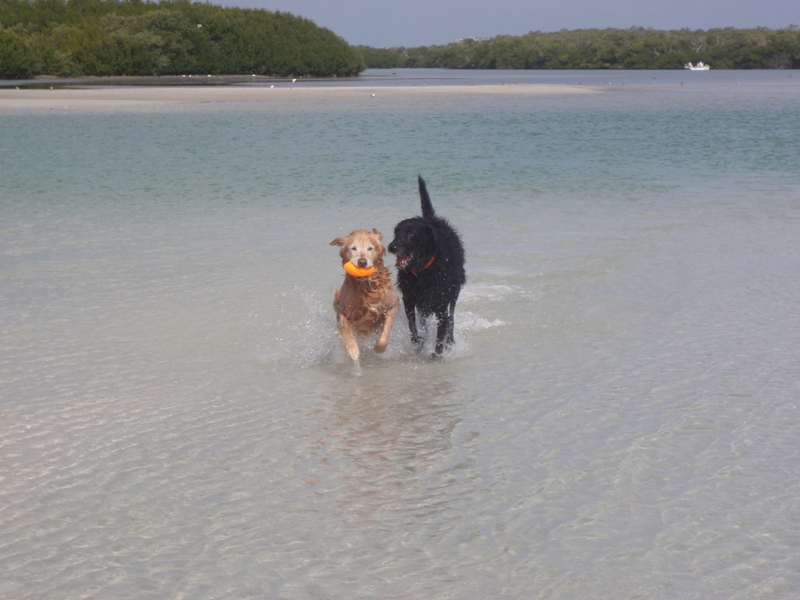 Although many dogs like to play in the ocean, make sure your dog doesn't drink the salt water. Instead, be sure to provide fresh drinking water and a bowl for your pet. A Beach Towel: Yes, I know we all typically remember to bring a beach towel with us to the beach, but pack an extra for your dog, so he can avoid resting on the HOT sand. A Beach Umbrella: And, that brings me to my next point. Your dog can easily get overheated in Hawaii. So, make sure you find a shady place for him to rest. A beach umbrella would be ideal, but you could even bring a beach chair for some shelter. Identification Tags: Because you are exploring a new and exciting area with your four legged pooch, it is possible that they will go wondering too far or stray from the owner, according to PetHub. Because they are unfamiliar with the territory, it is easy for them to get lost. Make sure to put a dog’s ID Tag on your dog as it is the most comprehensive way to get your lost friend home. Sunscreen: While you’re slathering it on yourself, don’t forget to put some on your pooch as well. Dogs are prone to sunburn just like humans, particularly those breeds that have short hair, white fur, and pink skin. Also of note, the hairless breeds that are becoming popular are more at risk than most. Even dogs that are well-furred can still burn on their noses and ears, so apply sunscreen to the nose, ears, and body at least half an hour before going outside. Another area that is often overlooked is the paws. If the sand is too hot for your feet, chances are it’s also hot enough to burn your dog’s paw pads. 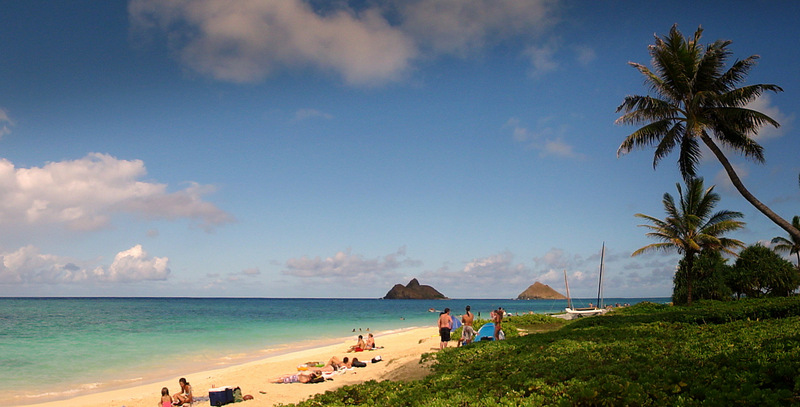 Lanikai Beach, among many others, allows dogs on the beach, and some owners elect to take their dogs off their leashes. Just remember that the official law in Hawaii is that all dogs must be on leashes on the beaches. First Aid Kit: Shards of rock, shells, and debris such as broken bottles also pose a risk to your pet’s paws. If possible, bring some kind of paw protection. If a cut does occur, the bleeding can usually be stopped by applying pressure to the area. While larger and deeper cuts may need to be wrapped, immediate veterinary care is highly recommended. A leash: All Hawaii beaches require your dog be on a leash, unless he’s in the water (although at some beaches, people turn a blind eye to the law). So, bring a leash, just in case. In fact,Lanikai Beach, which guests visit during the Circle Island Tour of Oahu, is considered a dog-friendly beach, as are many others. Now that I’m a proud Hawaii dog-owner, I’ll need all the help I can get when it comes to dogs at the beach. So, come with me on my journey toward learning all the ins-and-outs of beach safety and etiquette!